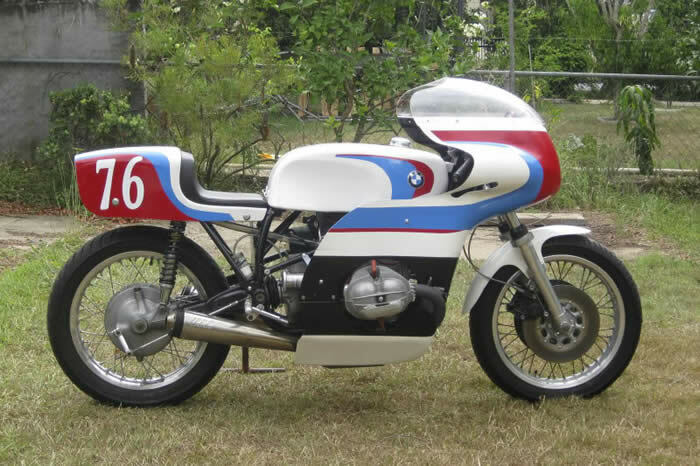 My BMW race bike is based on a 1972 R75/5. I started building in the mid 90s when my Norton was getting uncompetitive in the UK classic racing scene. 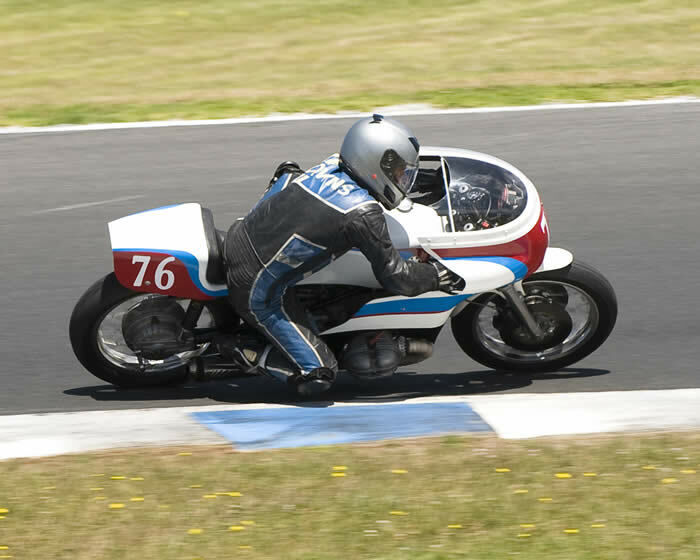 Having ridden one belonging to BMW tuning ace Jim Cray I decided I needed one myself, but tailor made to suit me as Jim's bike was far too tall for me. The frame was bought for $50 and given to Richard Peckett ( the P from P&M motorcycles) who braced it and made a special lower, narrower subframe. The tank was hand made from aluminium to my design by John Person who made the tanks for the Gus Kuhn racers of the 70s. The engine was left to Jim Cray who fitted a big bore kit and gas flowed the heads, fitted a race cam and big carbs and ended up with 92 horsepower at the rear wheel. It performed quite successfully at UK races with several wins and at Chimay in Belgium the bike never failed to win a race each year from 1996 to 1999 when I came to Australia. Being based on a touring bike, it's not the ideal racer. The handing takes a bit of getting used to with shaft drive and a crankshaft that causes it to turn right when the throttle is opened, but what it loses in handling, it makes up in power. It's less competitive in Australia against the big Honda's which weren't allowed in Europe, but occasionally it sees the chequered flag first.